In May 2017 Power to Change commissioned AHA Digital Ltd and Puntofisso Ltd to look at pockets of activity where data assets are being used locally. We drew up a long list of data practitioners across a range of different sectors and locations, and then narrowed the list down down to those we knew were actively using data at a local level. We then spent several months over the Summer conducting interviews. We originally anticipated interviewing around a dozen people, but ended up speaking to more than twenty to try and get a good cross-section from different sectors and locations. 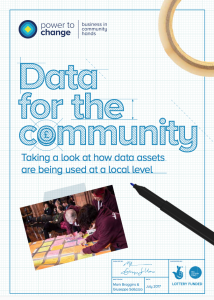 Our report: Data for the Community, published in November 2017, uncovers pockets of activity around data, highlights some areas of difficulty, and identifies some good practices which may be useful to community groups wishing to produce and use good quality information about their neighbourhoods.